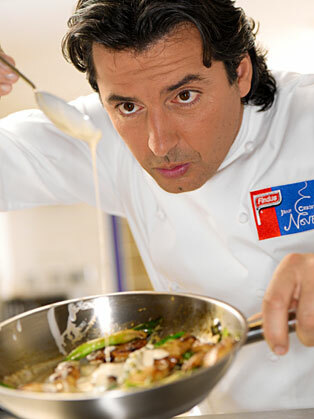 Jean-Christophe Novelli, the nation’s favourite French Chef, began his exciting career at the age of fourteen as a baker in his home town of Arras, Northern France, becoming head private Chef to Elie de Rothschild in Paris before the age of 20. Jean-Christophe's life changed completely when he arrived in Great Britain in 1983. Jean-Christophe spent a year helping his mentor and best friend Keith Floyd, taking care of his pub as Head Chef whilst Keith was filming his famous TV Shows. In 1996, Jean-Christophe opened his first restaurant Maison Novelli in Clerkenwell, London, followed quickly by Novelli W8, Novelli EC1 and Les Saveurs in Mayfair. In addition to his mini empire, Jean-Christophe also launched Novelli at the Cellars; Cape Town's leading five-star Relais et chateaux Hotel, Moulin de Jean in Normandy, France and was Chef Consultant on Sea France Ferries. Over his career Jean-Christophe has accumulated no less than four consecutive Michelin Stars. In recent years, Jean-Christophe was Chef Patron at Novelli at Auberge du Lac, Brocket Hall in Hertfordshire and also Novelli in the City, London Capital Club. After a successful three year relationship and putting both restaurants on the international map, Jean-Christophe decided to move on to new ventures. The Novelli Academy opened its doors on April 22nd 2005 and was voted up amongst the ‘Top 25 Cookery Schools in the World' within 3 months. Jean-Christophe restored part of his 14th century Hertfordshire farmhouse to accommodate the Novelli Academy in his own home. Jean-Christophe opened his first British gastro pub on Friday 13th January 2006. 'A Touch of Novelli' at The White Horse in Harpenden, Hertfordshire this is one of many new Novelli gastro pubs planned around the country and opened to rave reviews from diners, locals and celebrities alike. Over the years, some of Jean-Christophe's culinary accolades included ‘5 AA Rosettes’, ‘AA Chefs Chef of the Year’ 1998, ‘European Chef of the Year' competition representing Great Britain, ‘Face of the Future’ The Times 1986, ‘Newcomer of the Year' Carlton TV Awards, Egon Ronay ' Dessert of the Year 1992' for his famous Jack-in-the-Box dessert, many times voted ‘Restaurant of the Year’, awarded on numerous occasions ‘Best Restaurant of the Year outside London’. He has been described as having the ability to make women "Swoon at the flick of his whisk!" and Harpers & Queen in 1999 described Jean-Christophe as the "5th most alluring man in the world”, “World’s Sexiest Chef” (New York Times) and voted by sky viewers one of the “Top 50 most beautiful men”. Jean-Christophe's TV Career is going from strength to strength and he has appeared frequently on British screens throughout 2007. The Hell's Kitchen star, who featured in a breathtaking endurance documentary show 'Alive' filmed in extreme sub-zero temperatures in the snow-capped Andes mountains, also appeared on the digital UKTV 'Food Uncut’, not forgetting X Factor 'Battle of the Stars', 'Family Fortunes', ‘Al Murray’, ‘Ant & Dec Saturday night takeaway’ and ‘The Apprentice – you’re fired’. Jean-Christophe was also seen this year in regular slots of 'The Richard and Judy Show', 'Saturday Cooks', ‘Soap Star Super chef’ and 'Daily Cooks'. He also appeared on the recent series of Hell’s Kitchen, supporting his very good friend Marco Pierre White. In September Jean-Christophe was awarded an Honorary Doctor of Arts from Bedfordshire University for his 30 years in the trade and achievements in cooking. Jean-Christophe is only the 3rd Chef in history to achieve this recognition!